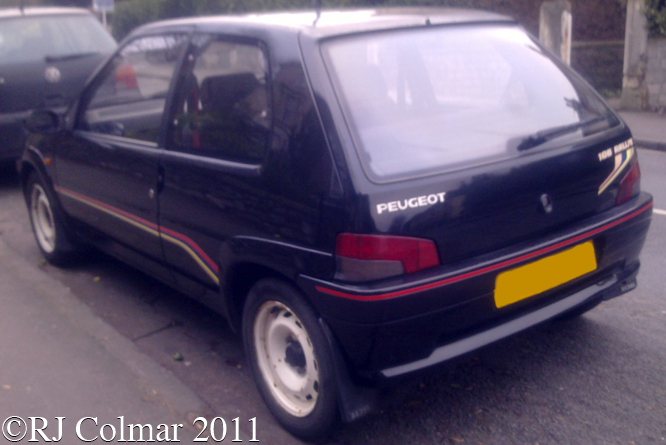 Launched in 1991 to replace the entry level Peugeot 104 the Peugeot 106 was available with either 3 or 5 door bodies and remained in production until 2003 with 2.7 million units built. 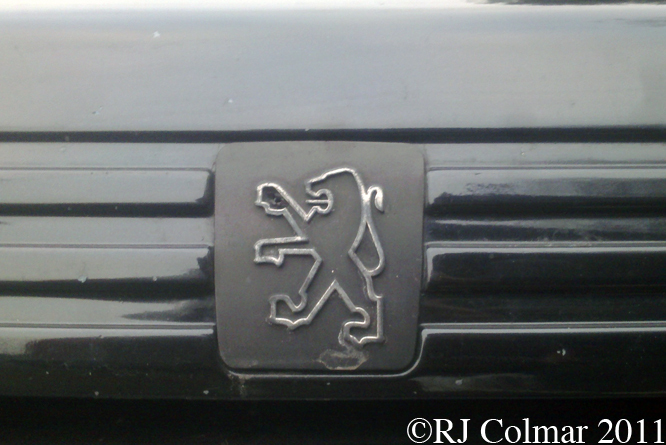 In 1993 Peugeot introduced the 106 Rallye version with the strap line “Less Frills, More Spills” in order that the model could compete in the international Group N and Group A classes. The Rallye is powered by a 100 hp 1294 cc / 78.9 cui 4 cylinder fuel injected engine which drives the front wheels through a five speed manual gearbox. Uprated suspension with thicker anti roll bars, were factory fitted on the Rallye as were the strengthened front suspension mounting points, for the competitor the sound insulation materials were easily removable. 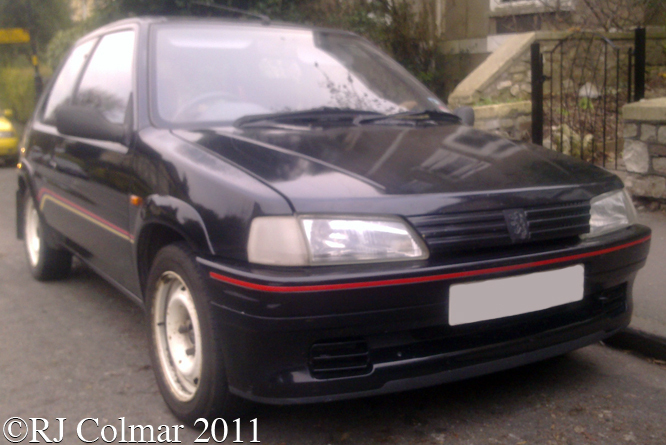 Rallye 106 S1’s manufactured between 1993 and 1996 were available with a choice of only three colours Bianco White, Cherry Red or Black with the wheel arch extensions and bumpers all colour coded. Peugeot Sport strips, shared with the 1992/93 Le Mans winning Peugeot 905’s, red piping and white lightweight steel wheels completed the sporty look and kept the weight down to 825 kgs / 1818 lbs. 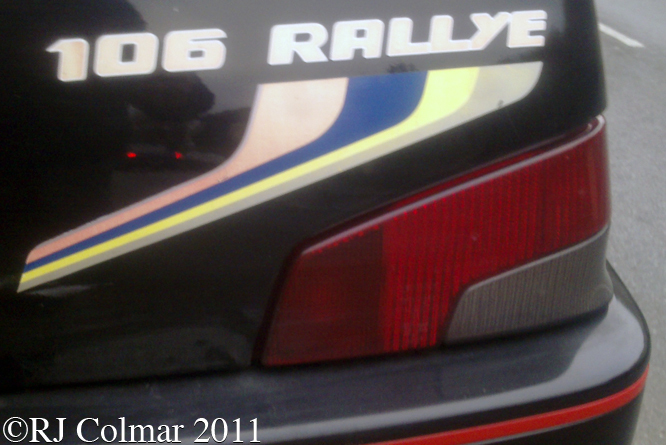 Inside the 106 Rallye was fitted with lightweight red carpets and matching red seat belts. 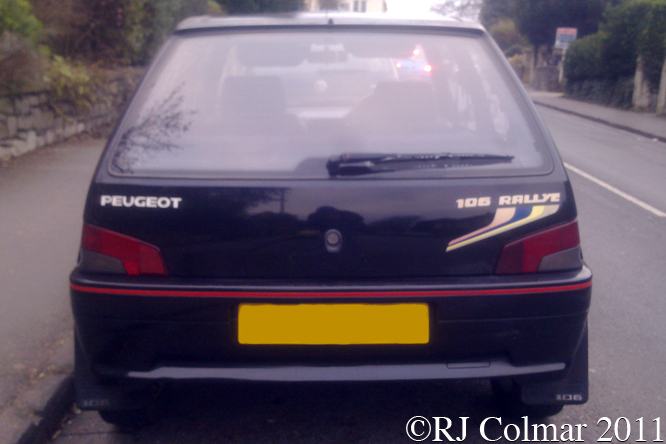 Initially Peugeot imported 1,000 right hand drive 106 Rallye’s but it is believed more were ordered due to unexpected demand, today’s featured Rallye seen in Bristol some years ago was registered in the UK on the 21st of January 1994. Thanks for joining me on this “Fewer Frills More Thrills” edition of “Gettin’ a li’l psycho on tyres” I hope you will join me again tomorrow when I’ll be visiting Queen Square. Don’t forget to come back now ! 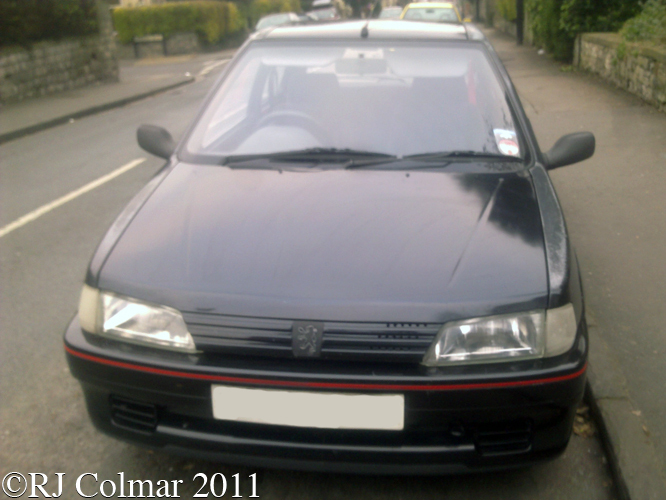 This entry was posted in Uncategorized and tagged 106, A, Bristol, Colmar, Group, N, Peugeot, Psychoontyres, Rallye, Ralph, Sport on August 25, 2015 by Ralph. The Vauxhall A type was one of the preeminent 3 litre / 183 cui cars of its day competing for a share of a limited market for prestige vehicles alongside Bentley, Rolls Royce, Daimler for favour amongst European nobility. The A-Type was the first production car designed by Laurence Pomeroy, it evolved through 4 distinct stages between 1908 and 1914 along the way amongst its notable achievements were many wins in a variety of events from trials and reliability events in the hands of customers while the factory built a single seat streamlined version that became the first 20 hp car timed at over 100 mph over a flying half mile at Brooklands. Of the 940 total production less than two dozen are thought to have survived many of them are in the Antipodes where these rugged vehicles were extremely popular. In 1912 Pomeroy introduced a new 4 cylinder engine design featuring a chain drive for the cam and magneto. The new engine was built in 3 litre / 183 cui and 4 litre / 244 cui sizes with the smaller engine being fitted to A types and the larger engine to the larger D-Type chassis, remember body work was usually supplied separately to customers bespoke requirements by independent coach builders. The D-Type won a contract from the Ministry of Defence for Staff Cars during the Great War 1914 – 1918. 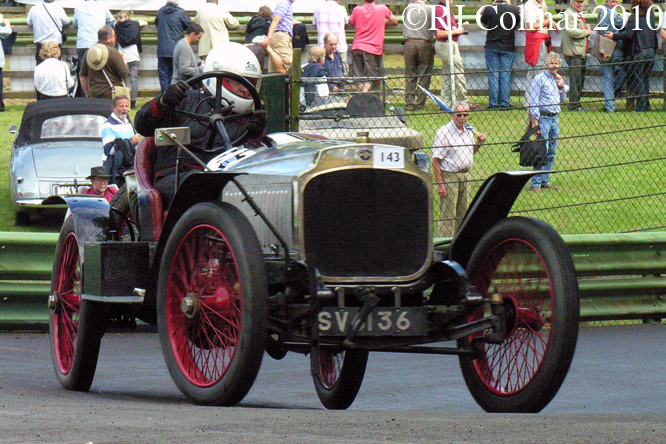 This particular car owned by Dr. A. N. Lockhart and driven by James Gunn seen here at Prescott last year, comprises a 1914 A-Type chassis one of just four thought to be in the UK, with the larger 4 litre / 244 cui 1918 D-type motor. My thanks to Dr A.N. Lockhart who’s web page on the Vauxhall Type A and D‘s proved indispensable. Thanks for joining me on this 244 cui edition of ‘Gettin’ a li’l psycho on tyres’ I hope you will join me again tomorrow. Don’t forget to come back now ! 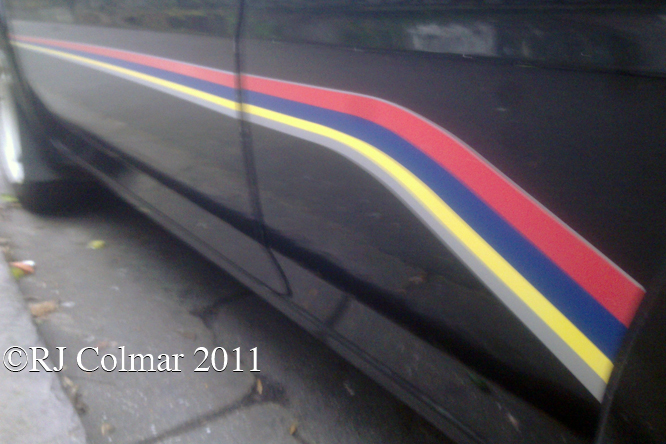 This entry was posted in Uncategorized and tagged A, Art, Brooklands, D, Dr, GALPOT, Gunn, James, Laurence Pomeroy, Lockhart, N, Tidesco, Type, Vauxhall on October 5, 2011 by Ralph.